I’ve spent a long time now, looking at different ways that psychology might be applied to improve education. I’ve learned about networked learning; how knowledge is stored more intelligently across groups. I’ve researched motivation; the ways in which student empowerment and student directed learning creates a more whole educational experience in the individual. I’ve read about the flow state of mind, being captured by the moment in a most pure state of intrinsic motivation. I’ve found out about the dangers of carelessly deployed technology, which only teaches students to accrue points, or merely provides a virtual alternative to what worked perfectly well with paper. Indeed, I would say that not many of the present classroom applications of technology are really hitting the nail on the head. There is, however, one computer game, which seems to apply these ideas exceedingly well: Minecraft. This retro style indie game has risen to be the best selling PC game of all time. It is an open ended, sandbox style game, in which plays build things through placing and removing blocks. The game has developed over several years, giving users items such as switches, power sources and hoppers, allowing for some quite smart mechanisms to be created. It began with the automation of ‘crafting’ (putting several raw materials together to create a new item), however as peoples ingenuity has developed, so have their creations. Right now, they’ve advanced as far as having built 16-bit computers. In a very real way, the entirety of the enlightenment and the industrial revolution have now repeated themselves – in a cult computer game! 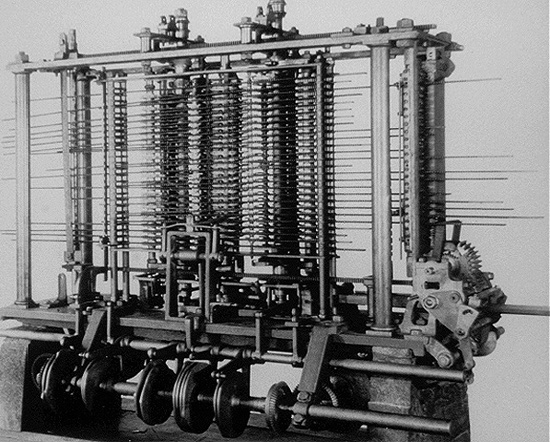 The Analytical Engine, the mechanical computer proposed by Charles Babbage. Now, you need to think about that for a second. Think about what a computer is, and how they have developed. What is now done in a microprocessor, was originally done through a contraption which filled a whole room. Furthermore, before even that, the first computer ever to be invented was entirely mechanical. Now, we have an army of young people replicating these archaic structures using Minecraft. This community incredibly well networked. Take a look at the number of examples and tutorials that come up with you search ‘minecraft redstone computer‘ on Youtube. When one learns, the wealth is shared. And when the one shares their understanding with the many, that individuals own understanding is strengthened. Ideas bounce serendipitously, and the evolution of these systems has been rapid. The bottom line of it is this: young adults, teenagers and children even, within this community, can master the very fundamentals of modern day computing. I don’t even understand that, and I have been a computer enthusiast since I had my baby teeth. This is the type of educating that is fun, motivating and above all, highly effective. Each and every learner within the Minecraft community is participating in a race to the top. These skills and this understanding are the very thing that will drive knowledge economies to excellence. To this I would ask what parallels can be drawn, to make an educational model as resonant as the Minecraft community. It would be very different. It would challenge all convention. It would likely be chaotic. However these things have all been recognised as attributes contributing to a successful knowledge economy. It would be a brave teacher to set up a Minecraft lab inside their classroom, but hey! Here’s to the crazy ones right? I was re-reading the paper by George Siemens entitled: Connectivism: A Learning Theory For The Digital Age. While I was reading, something hit me. Siemens talks about the way the abundance of information in today’s world is forcing us to do things differently. He explains how the continuity that existed for people in days gone by is all but gone. People living in previous generations may have trained for one career and remained engaged with that their life long. Now, however, we have an ever growing pot of knowledge which would be almost impossible for any one person to handle or evaluate. A solution, which Siemens calls connectivism, stores knowledge across social networks instead. In connectivism, groups of people benefit from laterally stored knowledge, which is then evaluated almost phenomenologically by the collective intelligence of the group. Now all this is very smart, but where does it fit in to the real world? Well. Once upon a time, a couple of hundred years ago, there was a different revolution: the industrial revolution. We discovered that we were sitting on an abundance of fossil fuels. Through organisation and the division of labour, the production capacity of what had been until very recently a manual process, grew exponentially. In the UK, productivity benefits from the division of labour have been commemorated on the £20 note. This is the information revolution. Our fossil fuel is computing power. As we use one another as a surrogate for knowledge (Stephenson, undated), our modern replacement for the division of labour is the division of knowledge. Just as our industrial ancestors created highly productive patterns out of the chaos, businesses and researchers alike can benefit holistically from team work and effective divisions. When I hear talk of the knowledge economy, I am aware that this is not merely a transition to office jobs. Those who will thrive will be those who can sift through the meaningless noise and identify the applications that will yield a real benefit. I discovered this morning that Harold Jarche had written about how at Bangor University we had been teaching the Personal Knowledge Mastery (PKM) framework to students. As a ‘Psychology Information Technology Skills’ (PITS) tutor, I have played an important role in teaching PKM, and wanted to share a bit more about my experiences throughout the year. We actually faced a few challenges in helping the students warm to PKM. It seemed that many could not see the reason why they had to do PKM, and also that many struggled to catch the vision of how to do it. A lot of students had expected higher education to involve memorising information to pass exams, as they had previously done in school. PKM did not have that same type of measurable outcome and many students would ask me what exactly it was they needed to do to pass the class. However, a few did grasp it well. One student informed me that she kept a fashion blog, through which she had established a network with several clothing labels, who would send her free products to review. Other students ventured to find my twitter account, or to join Pinterest and Scoopit. Students who had used Pinterest previously were also quicker to grasp of PKM, perhaps because the way Pinterest users collect and curate content is similar to PKM’s seek, sense and share framework. Perhaps PKM is the difference between higher education and that of the typical high school. That it was challenging to foster may be akin to the old adage that ‘you can bring a horse to water, but you can’t make it drink’. Indeed it is personal, because you do it for yourself. Nobody else is there to grade or assess you. If people don’t want to do it, that’s fine! However they may loose out as the knowledge economies adapt to future needs. For research and knowledge based economies to work, they need to be more than just transferring information. It is the intrinsic passion and ingenuity that transforms information in to actions or solutions to problems. It comes from within, and that is why (beyond teaching the PKM framework) it can’t be forced. Some will do it and change the world, others won’t. This takes me on to my second point: PKM as a masters degree. This last year, I took a class called ‘Science of Education’. It was an open ended, ‘autonomy supportive’ blogging module. We would go away, and do some research, and disseminate what we found through writing a weekly blog. Additionally, we would write five weekly comments on fellow classmates blogs, to academically critique their work. We would seek the information, sense what is being portrayed, and share our own ideas in relation to the content. With social media as the platform, each class member came away with their own blog: a portfolio of ideas and discussions, as well as links to original sources. Bangor University have just agreed to expand the module into a masters degree, run as a MOOC (massive open online course). Students will be able to specialise their knowledge of the ‘scholarship of learning’ through blogging and participate in an online critical discussion. Participation is free and open, as will be the learning and knowledge management skills which are drawn from it. However, those who pay a course fee to the university may have their portfolio assessed and accredited. Students may then graduate from Bangor University with a post graduate certificate, diploma or a masters degree (the level of qualification depends on the number of modules completed). I consider PKM to be a really exciting development in the way we handle learning and knowledge. It brings meaning and depth to the information we work with, and makes it both accessible and memorable. You might even say it turns information into knowledge. It doesn’t happen automatically, but with practise and involvement, I believe it can make a person very effective in their work. I am excited to see this program commence at Bangor University, as it is a brilliant development for both MOOC’s and knowledge based economy’s. This is a great step forwards for higher education practise and the scholarship of learning. I have spent a lot of time studying the use of social media in relation to education, and I have concluded that it is very useful. Evidence suggests that crowd sourced projects (such as Wikipedia) actually work, and contain a lot of depth in their articles. The manor of empowering individuals to connect with experts and peers, to share and to discuss, leads learners to enter the flow experience and benefit from intrinsic motivation. But where does that fit in with employers? Surely it would be a significant turn off to a recruiter when Jimmy the graduate enters and starts lobbying colleagues to use twitter, or to blog on a public forum about day to day operations? It might be fair to say that while academic can benefit from tearing down walls, an element of business success surely comes from keeping them up. An article by Rachel Happe (2013) provides a good synopsis of the ‘what’ social media can do. And it needs to be noted that social media is merely the vehicle through which it is delivered. Too many people have seen the ‘like us on Facebook’ ads on the back of the breakfast cereal box, or have seen someone on Facebook repost some meme and equated that with social media’s benefits. But the real benefit (and this is why SM is only the vehicle) is in the human relationships that it quickens. 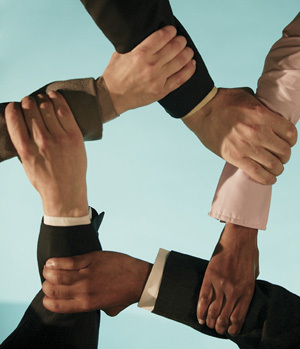 Building relationships is the essence of a dynamic organisation. Experiential learning is essential, but cannot be transmitted via lecture or writ. What you need is the person. Not only do you need the person, but the person needs to be empowered to share. Now think about the reasons they might not share? They might be dissatisfied with their job, they might have fear of becoming dispensable, or they might feel animosity to the person needing the information. Trust and unity are the principles behind the networked organisation for which SM is the vehicle. As I said before, the university benefits from taking down its walls to the wider world. The business could benefit from at least taking down walls within. Empower the employees to make their own connections. Let them have fun and communicate over their areas of expertise. Regardless of the medium used (email often still suffices) it is the intrinsically motivated and connected workers who have the flexibility and connections that let the organisation solve problems dynamically – in a whole new way. I don’t even think this is a surprise for a lot of businesses. People have been talking about networking for years. But often it is still an uneasy topic to approach. Still, for motivation and new solutions let these principles be born in mind. The work in education, and according to Harold Jarche (2013), learning is the work! This is my talk on 1:1 iPad policies and social learning that I gave as part of my Science of Education class of my undergraduate psychology degree. Of the many movements seeking to comission 1:1 computer access in education, I review the arguments for and against, specifically relating to the recent ‘hull report’. I talk about how the mere distribution of iPads to students without pedagogical change has key shortcomings, yet when looked at through an autonomy supportive social paradigm, they can be a real enabling force for students. One iPad Per Child by Chris James Barker is licensed under a Creative Commons Attribution-ShareAlike 4.0 International License. I’ve found myself at the computer in the short period before my first class of my third year, and I’m wondering what would be the best use of my time. As I look back over my previous blog posts this year, I’ve had the opportunity to reflect on what went well, and what didn’t go so well. The second year psychology syllabus is considered the hardest year of the three, because it contains a lot of content which is required to meet the British Psychological Society specifications. And I struggled with a lot of parts of it. Since in my own dissertation project group our paradigm assumed that large amounts of memorisation does not constitute proper learning. I think a few of the things I have written my have carried that frustration. But now we have a fresh start, and I’m looking forward to studying some specialised modules this year which utilise new teaching methods. We’re also excited to see our social media in learning research take off. My goal this year is to score a first class degree, something I believe is attainable. I’m intending to achieve this through putting in the time to study, but also ensuring that the work I do is not wasted effort. I believe part of this will be worked through introduction of Personal Knowledge Management (PKM) (Jarche, 2013). I will be using twitter, wordpress and evernote to channel, record and index my thoughts, and to engage in the online discussion. Surely I also need to be wise in how I work to the grading criteria that has been set, but all this I hope will be quickened though reflective and synthesising pieces contained on my blog.